This functional model provides a graphic demonstration of the anatomy and mechanics of the joint, allowing better doctor-patient or teacher-student understanding. Use this life-size and fully flexible joint to demonstrate abduction, anteversion, retroversion, internal/external rotation and much more. Consists of portion of femur, tibia and portion of fibula; also includes meniscus, patella with quadriceps tendon and joint ligaments. On stand, removable. It's easy to see what's going on in the knee with this model, so it's good in that sense. 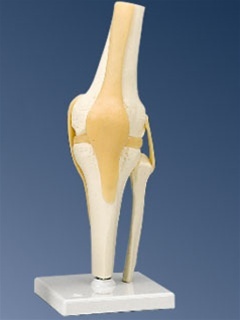 I just hope this new one is more abuse-proof than our previous (same model) knee joint, as the ligaments in that now-deceased model tore all too easily. I hesitated to check the word "flimsy" in the multiple choice evaluation, but there was no "hope it's not as flimsy as the older version" choice.